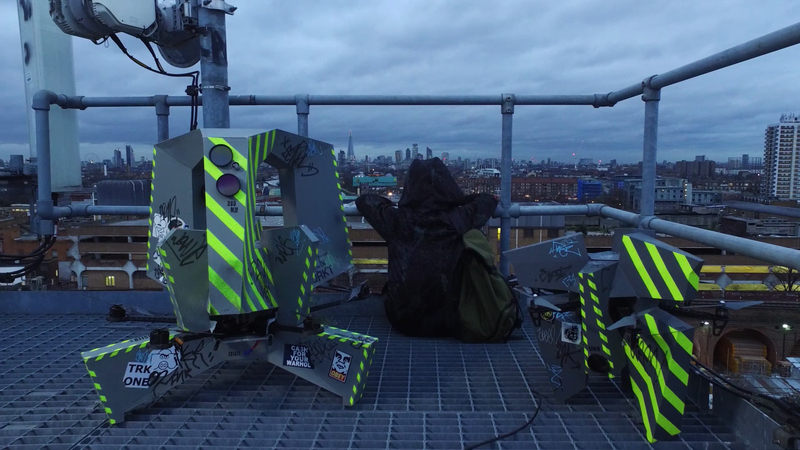 Directed by speculative architect Liam Young and written by fiction author Tim Maughan, In the Robot Skies is the world’s first narrative shot entirely through autonomous pre programmed drones. In collaboration with the Embedded and Artificially intelligent Vision Lab in Belgium the film is captured by a specially developed flock of camera drones each with their own set of cinematic rules and behaviours. The film explores the drone as a cultural object, not just as a new instrument of visual story telling but also as the catalyst for a new collection of urban sub cultures. In the way the New York subway car of the 80’s gave birth to a youth culture of wild style graffiti and hip hop the age of ubiquitous drones as smart city infrastructure will create a new network of surveillance activists and drone hackers. 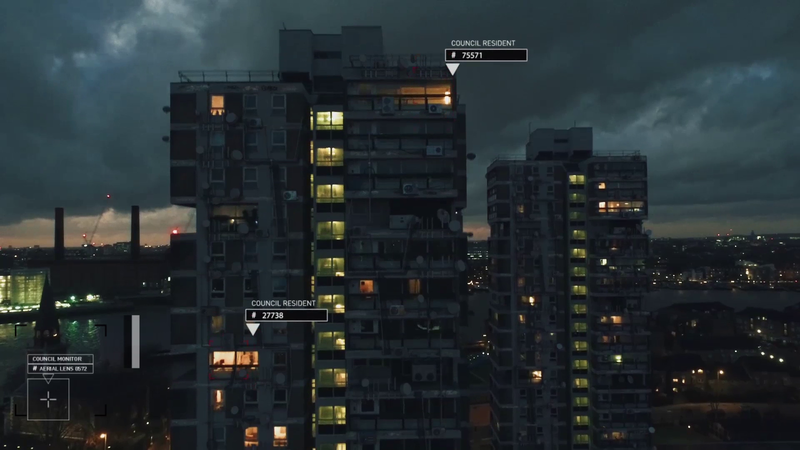 From the eyes of the drones we see two teenagers each held by police order within the digital confines of their own council estate tower block in London. A network of drones survey the council estates, as a roving flock off cctv cameras and our two characters are kept apart by this autonomous aerial infrastructure. We watch as they pass notes to each other via their own hacked and decorated drone, like kids in an old fashioned classroom, scribbling messages with biro on paper, balling it up and stowing it in their drones.. In this near future city drones form both agents of state surveillance but also become co-opted as the aerial vehicles through which two teens fall in love. Tomorrows Thoughts Today’s Liam Young and long time collaborator Kate Davies run the Unknown Fields Division. 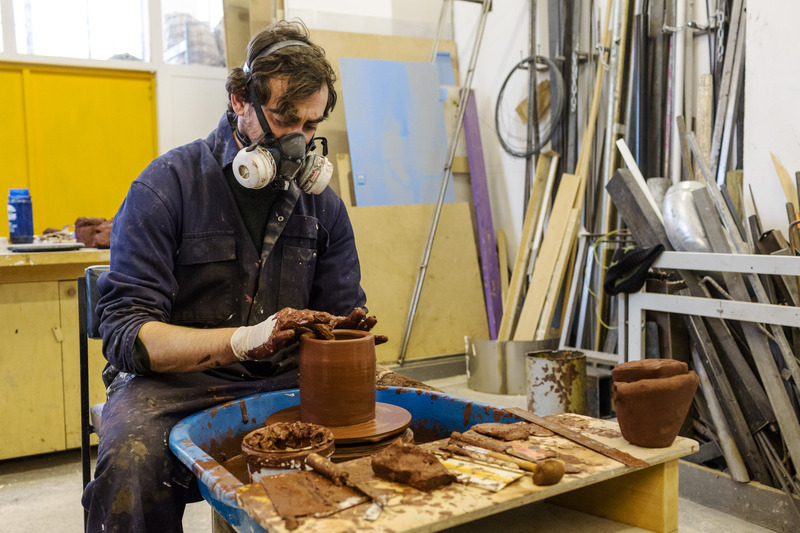 Unknown Fields have launched a new project called Rare Earthenware, developed for the ‘What is Luxury’exhibition at the Victoria and Albert Museum in London. While journeys to extraordinary places are the cornerstone of luxury travel, this project follows more well-concealed journeys taking place across global supply chains. 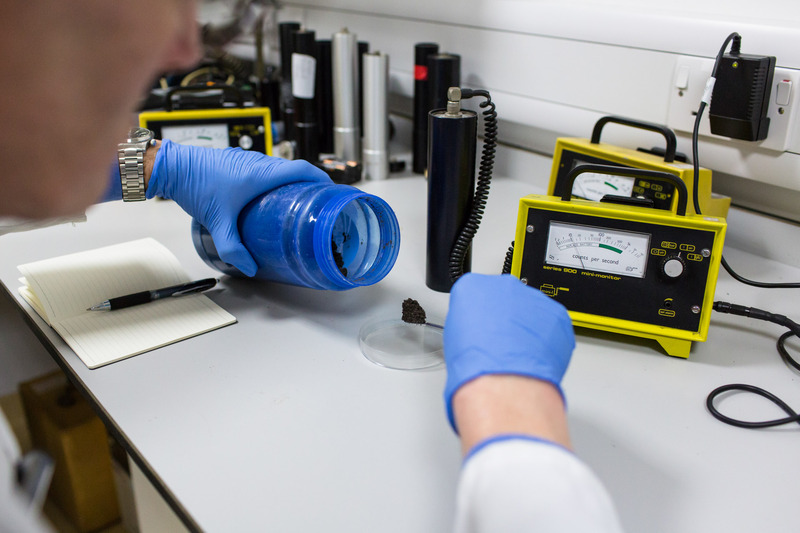 It retraces rare earth elements, which are widely used in high-end electronics and green technologies, to their origins. 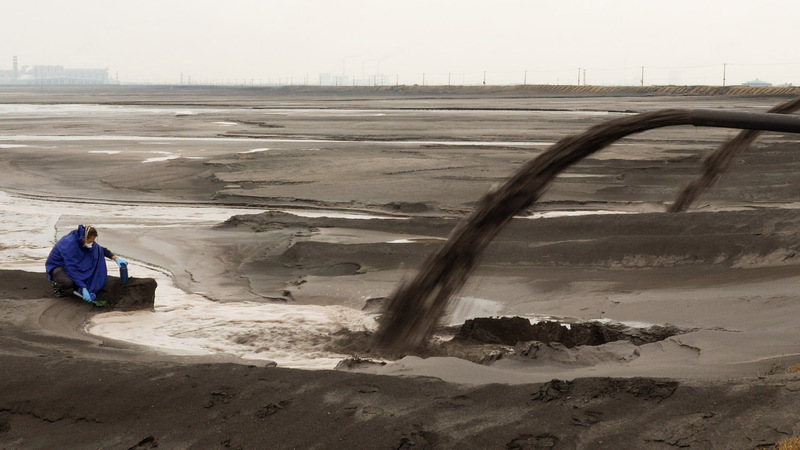 A film of the project, developed in collaboration with photographer Toby Smith is composed as a single panning shot along a planetary scaled conveyor belt, documents their voyage in reverse from container ships and ports, wholesalers and factories, back to the banks of a barely-liquid radioactive lake in Inner Mongolia, pumped with tailings from the refining process. 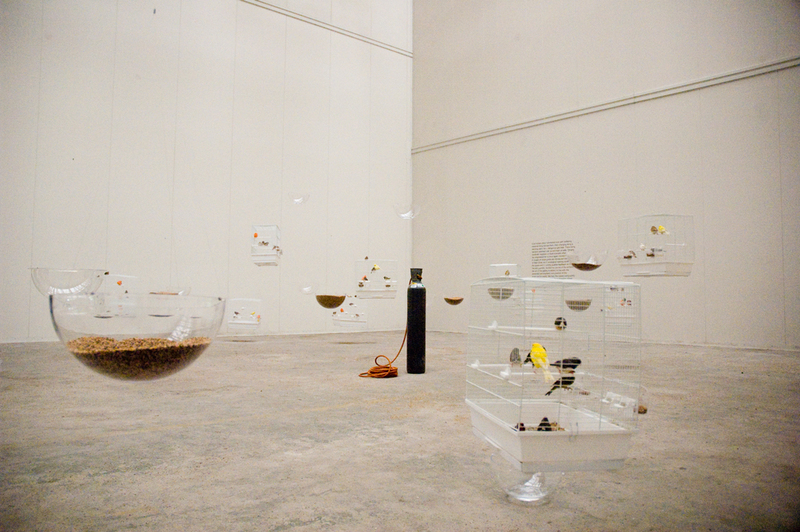 To accompany the film, Unknown Fields Division have used mud from this lake to craft a set of three ceramic vessels. 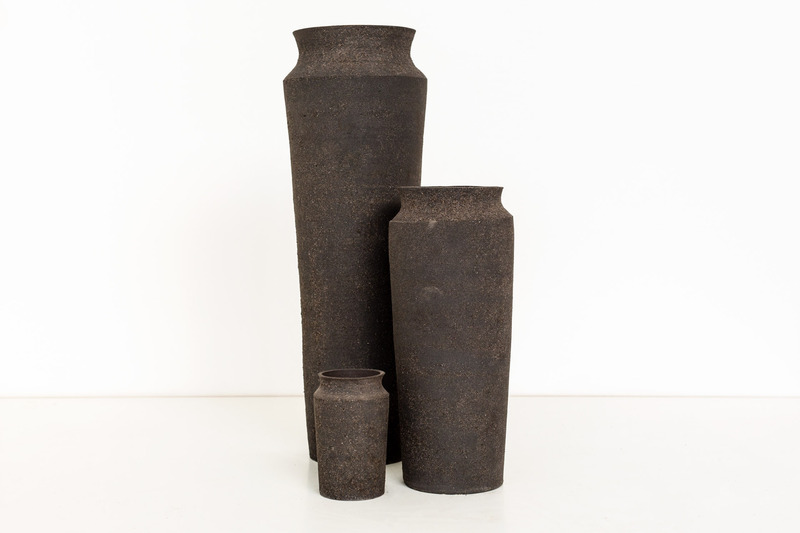 Each is proportioned as a traditional Ming vase and is made from the amount of toxic waste created in the production of three items of technology – a smartphone, a featherweight laptop and the cell of a smart car battery. 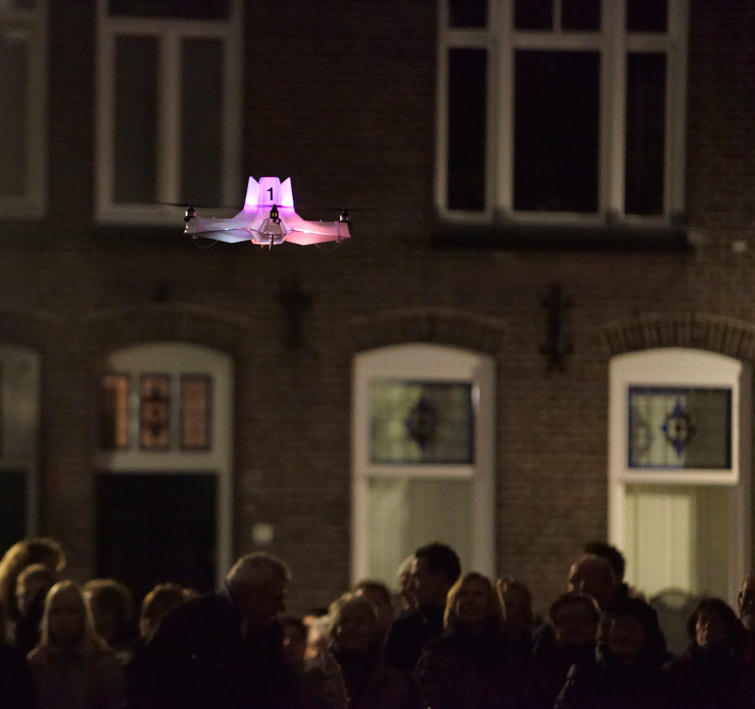 A flock of autonomous DJI copters are programmed as aerial dancers and are mounted with specially engineered wireless speakers to broadcast the instruments of the band. 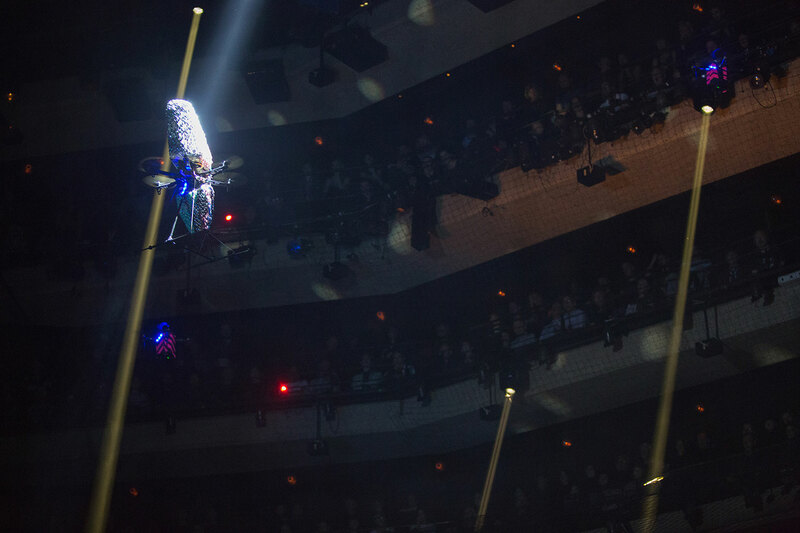 Other copters are dressed in elaborate costumes to disguise their form and reflect light across the audience below. Against a score of original compositions and selected tracks from Cale’s seminal career this collaboration with Young imagines the possibilities of the drones as emerging cultural objects. If these technologies are no longer unseen objects overhead, or propelled along classified flight paths but brought into close and intimate relations with us then how might we see them differently. When their transmission fades, when the drones lose their signal and without their protocols for terror and surveillance, do they drop from the sky, do they fall in love or do the drones drift endlessly, forever on loop. Watch the Bevis Bowden’s film cataloguing the Barbican performance on the 12 & 13 September 2014 and the making of documentary produced by The Creators Project that chronicles the teams development of a new ultrasonic tracking system that supported autonomous drone flight and programmed choreographies and the design of drone couture costumes. 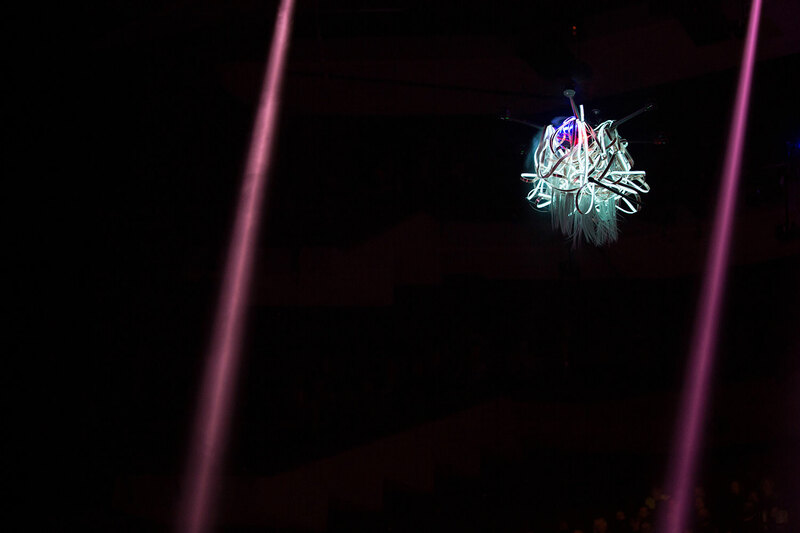 To support the live performance and allow remote experiences of the drone orchestra project, Liam Young and John Cale also joined forces with digital artists FIELD to develop an accompanying online interactive environment- City of Drones. 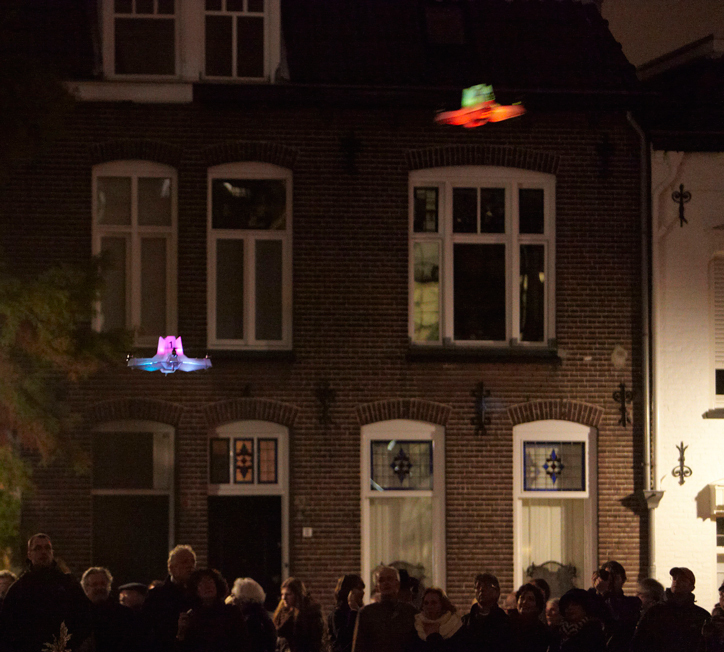 Charting the story of a lost drone drifting through an abstract vertical cityscape, players are invited to pilot a virtual craft and remotely explore this imaginary world. The machine vision of the drone reduces the city to pure geometry as flightpath algorithms plot courses along the narrow streets. Samples from Cale’s original soundscape compositions, developed for the live performance, echo across the landscape and we see the city through the eyes of the drone, buzzing between the buildings, drifting endlessly, in an ambient audio visual choreography. 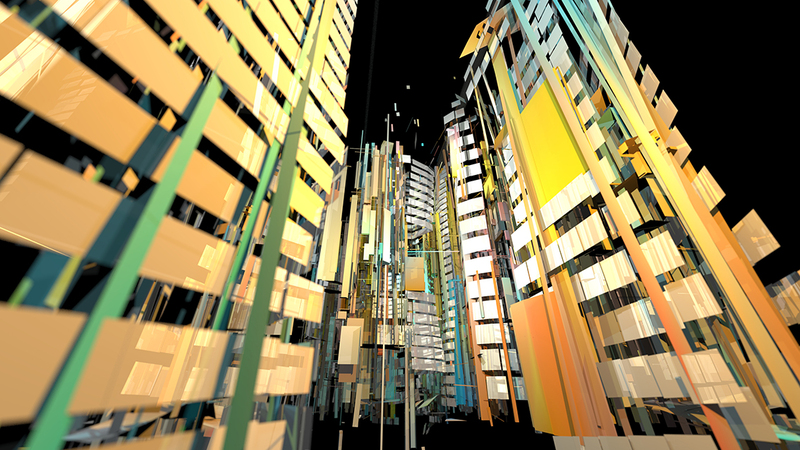 New City is a series of animated skylines of the near future developed by Tomorrow’s Thought Today’s Liam Young. In intricate 5k detail they depict a speculative urbanism, an exaggerated version of the present, in which we can project new cultural trends, environmental, political and economic forces. Photographs taken on expeditions around the world with nomadic studio Unknown Fields, to document these emerging phenomena and weak signals have been meticulously stitched together and extrapolated to form each city skyline. In this way ‘New City’ slips between the real and the imagined, between the documentary and the visionary, where speculative fictions become a way of exploring a world that the everyday struggles to grasp. To accompany the animations the authors Jeff Noon, Pat Cadigan and Tim Maughan have been invited to write a story for each skyline, to breathe life into its characters and cultures and give form to its streets and spaces through a suggestive narrative fragment. 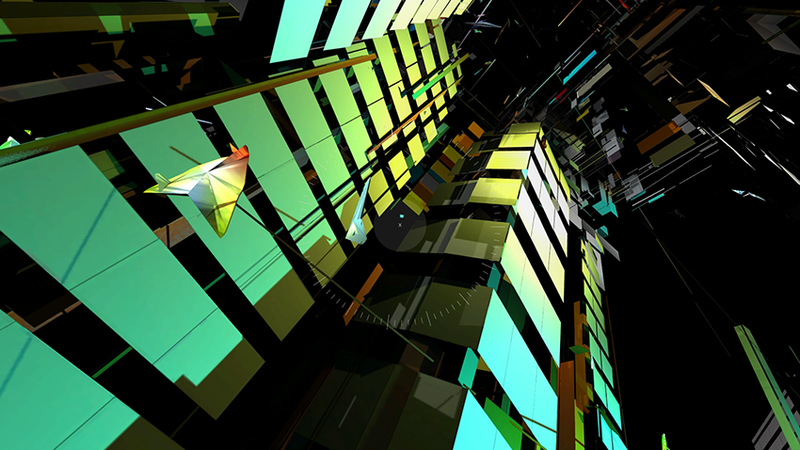 Original New City soundscapes have been developed by Coldcut. 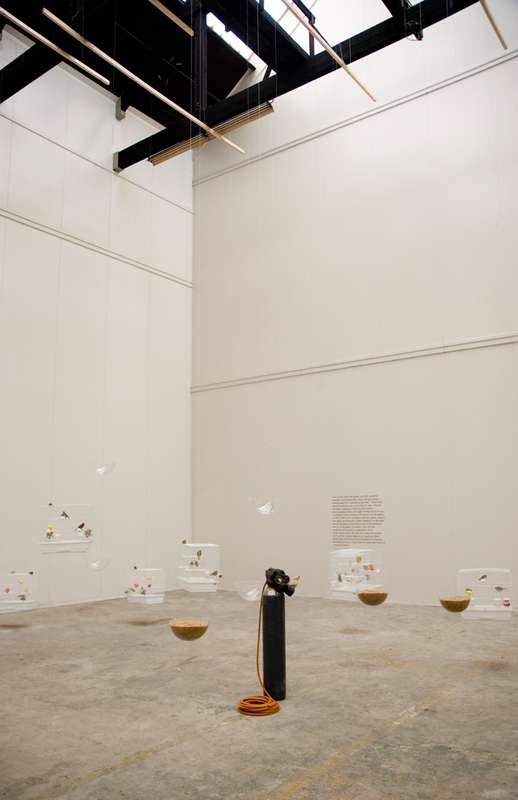 The animations have been commissioned by Z33 and are screening as part of ‘Future Fictions’. 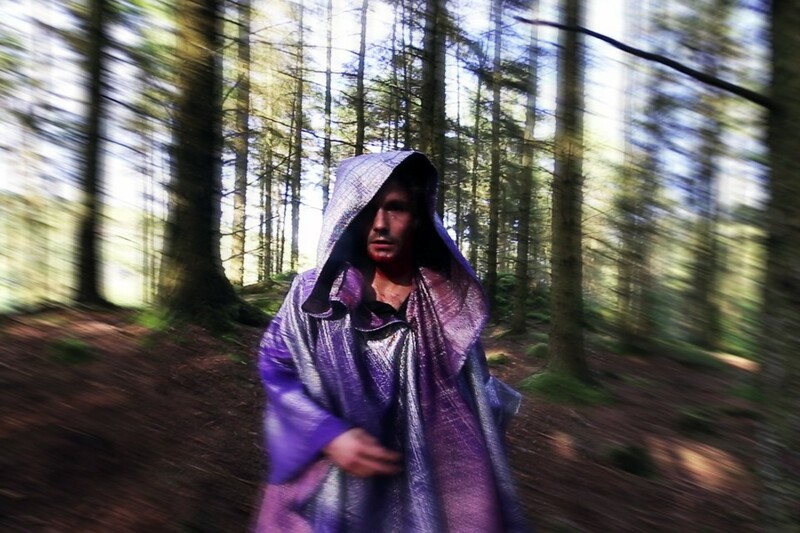 Musician John Cale and Tomorrows Thoughts Today’s Liam Young have joined forces with digital artists FIELD to develop a new interactive, digital work for BBC’s The Space. For nearly 50 years, John Cale has thrived at the vanguard of a myriad of creative disciplines, from setting the stage for an underground, noise-bending attack on rock and roll with the Velvet Underground, to his current genre-bending music of today. In his urban futures practise Liam Young has been telling stories about the possibilities of drone technologies in the near future city. 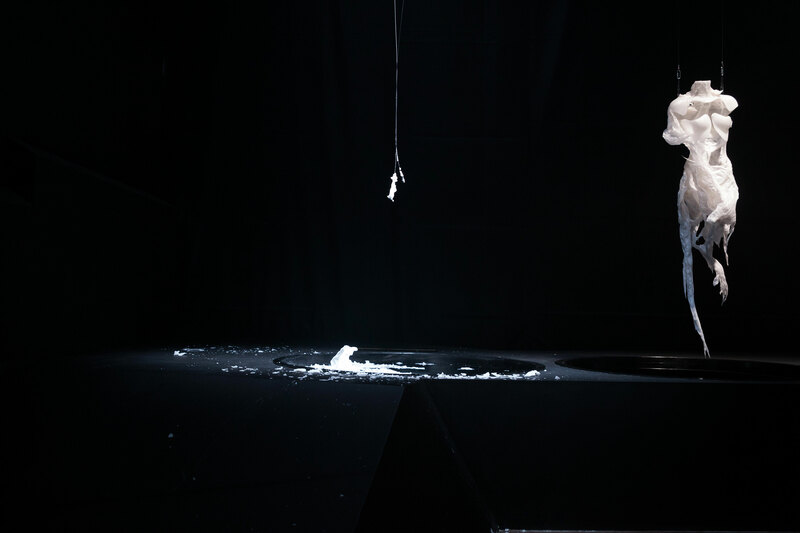 Typically associated with militarised applications, Young repurposes his collection of choreographed flying machines as both disembodied instruments and nomadic audio infrastructure, to create an immersive live music performance and visual spectacle. Known for experimenting with technologies and industrial sounds in his music, Cale once tuned his instruments to the hum of refrigerator motors, the frequency of modernisation. For this new commission he joins forces with speculative architect and storyteller Liam Young to explore the soundscape of a new generation, the distant rumble of drone propellers for a digital landscape and a live performance for the barbican centre. 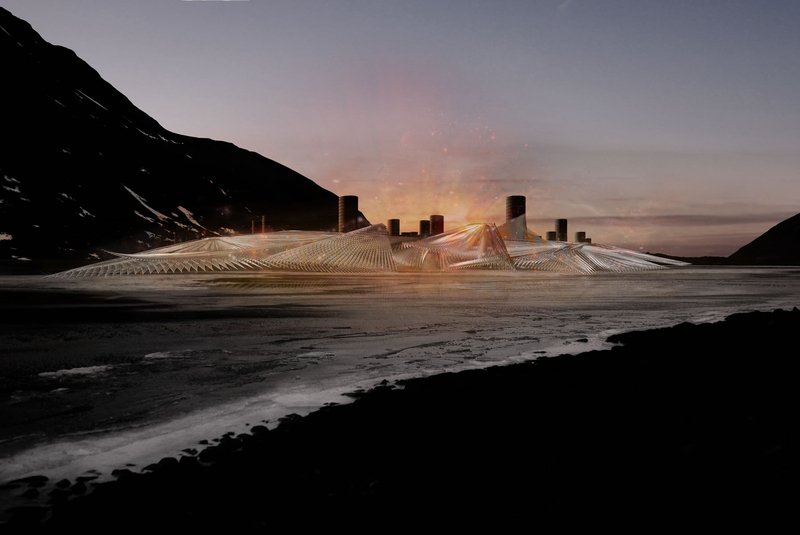 For The Space Cale and Young have joined forces with digital artists FIELD, who have developed an interactive digital landscape enjoyed as an online experience of the project. FIELD creates expressive audio-visual artworks – from digital paintings to high-end visual effects and generative design across all media, always looking for the drama in the code. 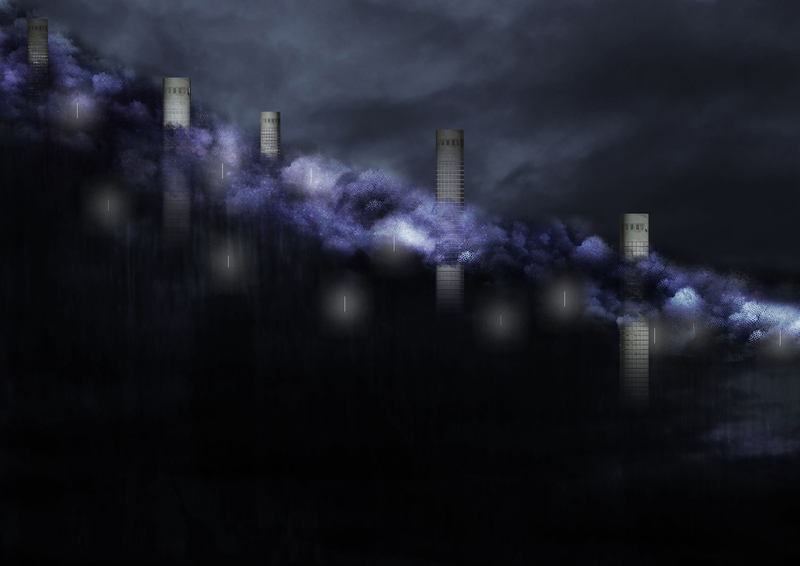 Charting the story of a lost drone drifting through an abstract vertical cityscape, players are invited to pilot a virtual craft and remotely explore this imaginary world. The machine vision of the drone reduces the city to pure geometry as flightpath algorithms plot courses along the narrow streets. Samples from Cale’s original soundscape compositions echo across the landscape and we see the city through the eyes of the drone, buzzing between the buildings, drifting endlessly, in an ambient audio visual choreography. You can read more about the live performance of the project here. City of Drones is on display now at Digital Revolution – the Barbican’s immersive exhibition of art, design, film, music and videogames and Transmissions for the Drone Orchestra Performance is live at the Barbican Theatre on 11 & 12 September. You can book tickets here. 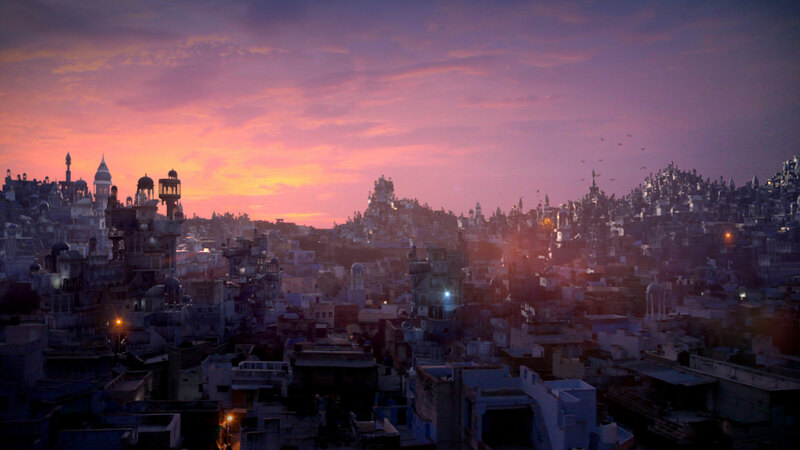 Future Perfect is a fictional, future city. A think tank of scientists, technologists, designers, artists and science fiction authors have collectively developed this imaginary place, the landscapes that surround it and the stories it contains. The think tank included futurist Bruce Sterling, author Warren Ellis, scientist Rachel Armstrong, and many more. You can watch the public think tank archived on the projects vimeo channel. The following series of posts presents the Future Perfect exhibition- a stage set for a collection of fictions, movie set models, emerging infrastructures and design experiments that can be inhabited as immersive districts of the future city. 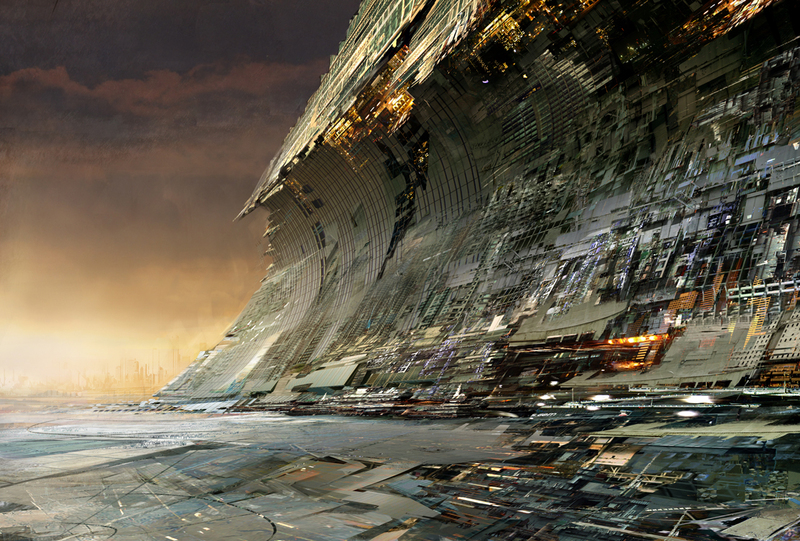 In this introductory post which outlines the vision of the project we see the early concept art developed with Daniel Dociu and Hovig Alahaidoyan. Emerging in the shadows of the decaying towers of a post oil Dubai, geo engineered by climatologists and influenced by the imminent economic boom of the Indian subcontinent it is a terraformed urban island. A city that grows intuitively, a creature, living, breathing and computing, a seething ecology that is evolving as a new metropolitan megaform. A speculative urbanism, an exaggerated present, where we can explore the wonders and possibilities of emerging biological and technological research and envision the possible worlds we may want to build for ourselves. For the future is not something that washes over us like water, it is a place we must actively shape and define. Through fictions we share ideas and we chronicle our hopes and fears, our deepest anxieties and our wildest fantasies. Some of us will be swept up in what the city could be, others will be reserved and look on with caution. We have not walked these streets before, what things may come, in a Future Perfect. Using fiction as a speculative tool in conjunction with scientific research to probe the outer reaches of the realm of possibility, project collaborations were forged between designers, research divisions and authors to develop a constellation of five works and accompanying short stories that make up the districts of Future Perfect. 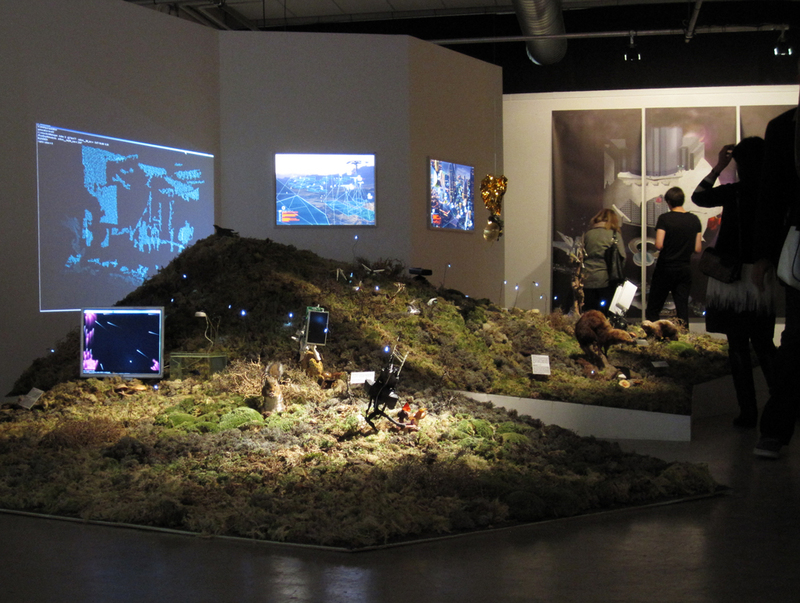 In the exhibition, visitors are invited to wander through them, reading messages embedded in the landscape, witnessing the increasingly responsive processes through which the city grows, self-regulates and communicates, scrutinizing a hybrid atmosphere where natural and man-made, digital and material, fact and fiction, become increasingly indistinct. Bots drift across this inhabited geology, a dense accumulation of crevice rooms, and public valleys. Through the strata is threaded the tendrils of a complex circulatory system that feeds the moist surfaces of a vibrant endemic ecology where nature and technology intertwine and biology becomes a new economy. Supercomputers whistle and whir; a virtual city, a parallel city overlaid directly onto the physical turns everything into interface, everything into program. The city watches on, breathing, blinking. Visitors begin their tour at the edges, in THE WILDS of the city. A new bioengineered species of pharmaceutical plants glisten under the light of its neon suns. Next they pass THE LOOMS, and their heads brush the webbed canopy of cable bots as they hum and spurt their nozzles across a section of virgin ground. It is a city that is grown rather than built, a computed territory, faceted and abstracted, endlessly reprinting itself as demand requires. 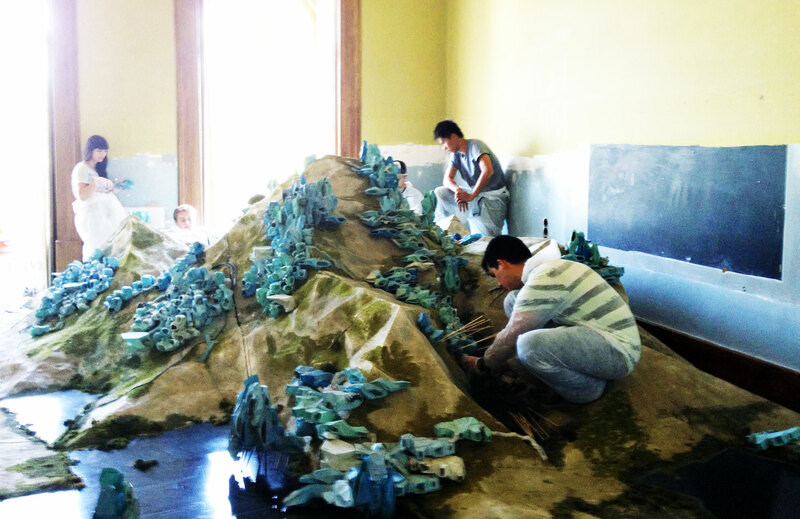 Visitors push past a laser-scanned mountain in THE SUPERCOMPUTER as its radiant digital landscapes become more real than the ground beneath them. 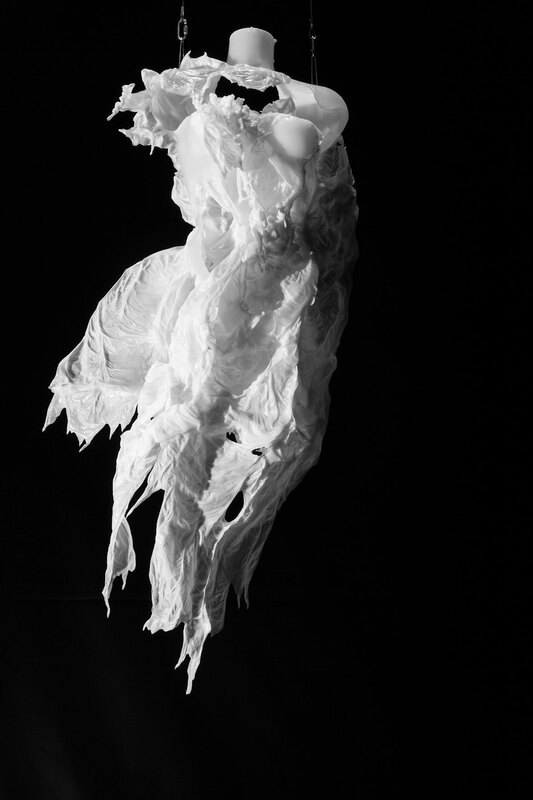 They gesture and a ghost iceberg parts, they wander through beyond the printing pools of THE GARMENT DISTRICT and the digital prosthetics hanging out to dry. As they come to THE LOOKOUT, Future Perfect unfurls in luminous detail in front of the visitors. They watch children playing running through the streets while the city struggles to keep up. 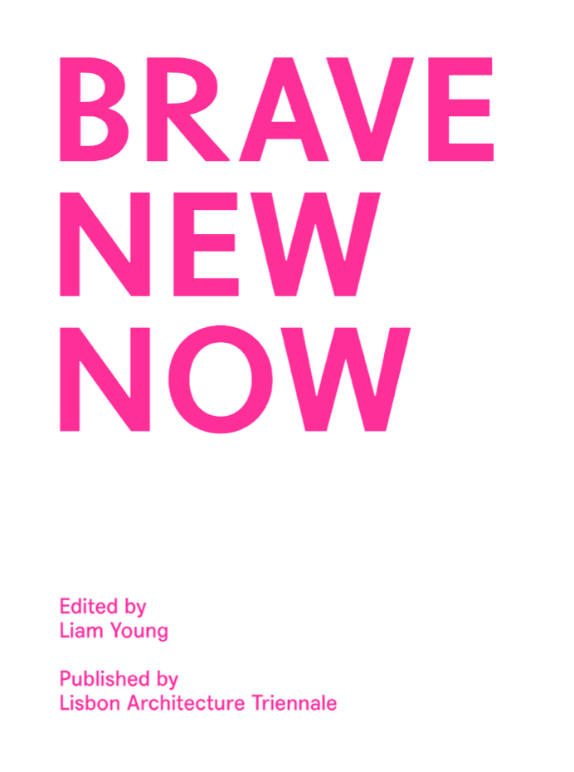 The short stories of Future Perfect have been collected in “BRAVE NEW NOW”, a book of original fictions set in the imaginary city and photography works. The ebook will be available for purchase shortly from close-closer.com and from the Apple and Kindle stores. “BRAVE NEW NOW” features original fictions by Rachel Armstrong, Bruce Sterling, Tim Maughan, Warren Ellis, Anil Menon, Jonathan Dotse, Samit Basu and photography by Victoria Sambunaris, Michael Wolf, Greg White, Neil Choudary, Vincent Fournier, Dan Holdsworth, Thomas Weinberger, Brice Richard, Daniel Beltrá, Christina Seely, Greg Girard, Bas Princen, Charlie Koolhaas. Future Perfect was produced for the Lisbon 2013 Architecture Triennale and is an evolution of Under Tomorrows Sky developed with MU, Eindhoven. 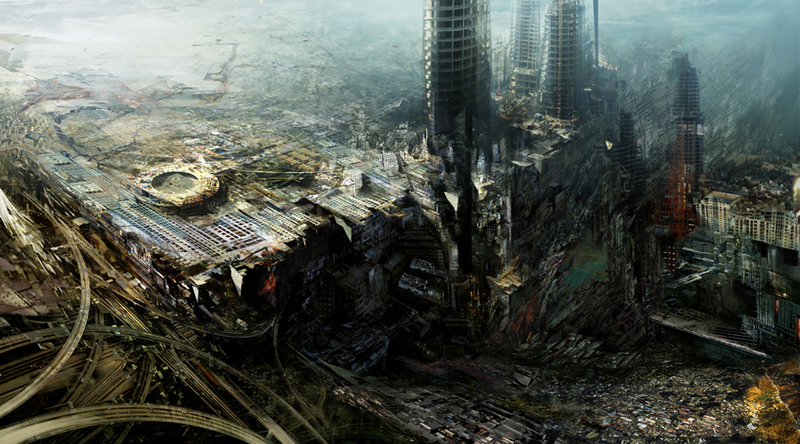 Future Perfect is a fictional, future city. 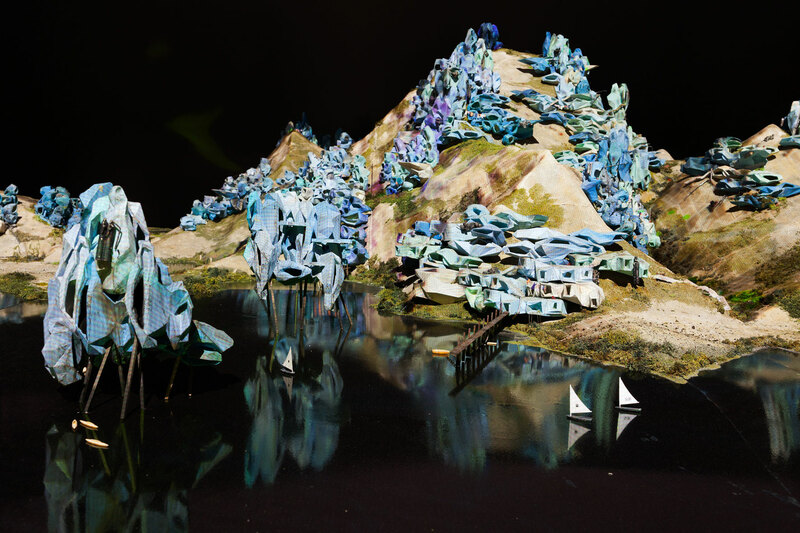 A think tank of scientists, technologists, designers, artists and science fiction authors have collectively developed this imaginary place, the landscapes that surround it and the stories it contains. The following series of posts presents the Future Perfect exhibition- a stage set for a collection of fictions, movie set models, emerging infrastructures and design experiments that can be inhabited as immersive districts of the future city. This post presents the Future Perfect Lookout, that spot up high in the city, where we lie on the hood of a car and from a clearing in the mist we scan across the city in luminous detail. The Lookout takes the form of a short film, Chupan Chapai, based on a story by Tim Maly, directed by Factory Fifteen and produced by Liam Young. A film is projected from the lookout that follows a group of children as they play a game of “hide and seek” in Future Perfect. Shot on location in across India, we see through their eyes a near future heavily influenced by the imminent boom of the Indian subcontinent, an emerging technology and economic superpower. The control systems that now run traffic systems, power grids and financial networks sit in the shadows, out of sight but silently organising our lives. Deep in the substrate of Future Perfect is a supercomputer that regulates the city and everyone within it. Reminiscent of an exaggerated silent film, everyone interacts with their digital city through intricate signs and gesture control. As the children play they learn to hack the augmented streets evading their friends but getting lost in the hidden spaces they have unlocked. They must escape from a sentient city that no longer recognises them. Future Perfect is a fictional, future city. A think tank of scientists, technologists, designers, artists and science fiction authors have collectively developed this imaginary place, the landscapes that surround it and the stories it contains. The following series of posts presents the Future Perfect exhibition- a stage set for a collection of fictions, movie set models, emerging infrastructures and design experiments that can be inhabited as immersive districts of the future city. 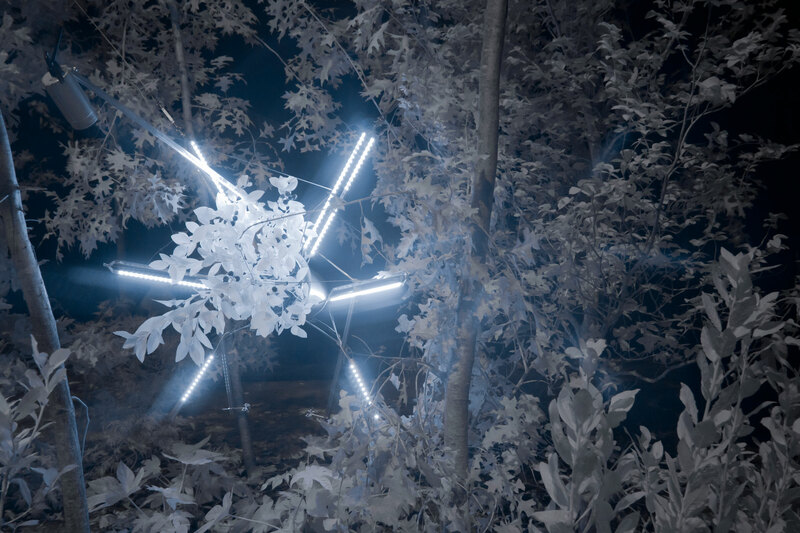 This post presents the Future Perfect Wilds, developed by artists Cohen Van Balen through their project Nowhere a Shadow. 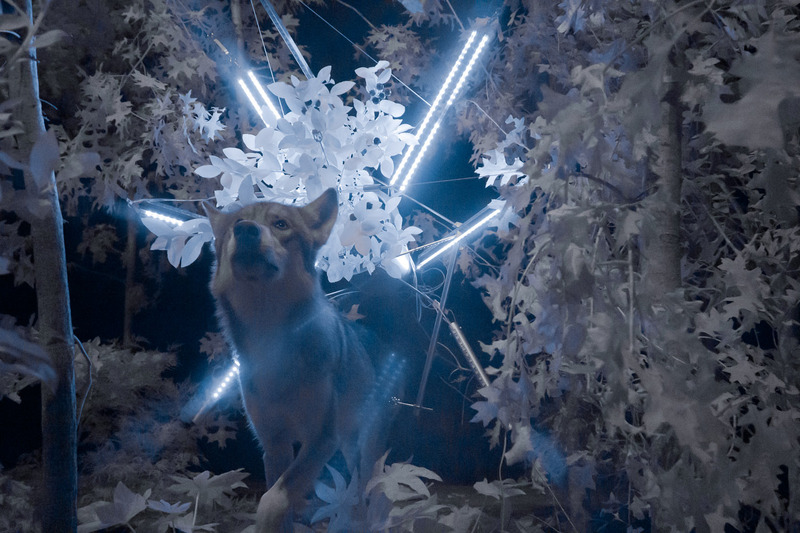 Watch as we let a live wolf stalk the landscape of the city. There is no nature anymore. We are wandering a new kind of wilderness, where the line between biology and technology is becoming increasingly indistinguishable. Through genetic modification, engineered meat, cosmetic surgery and geo-engineering we are remaking our world from the scale of cells to the scale of continents. 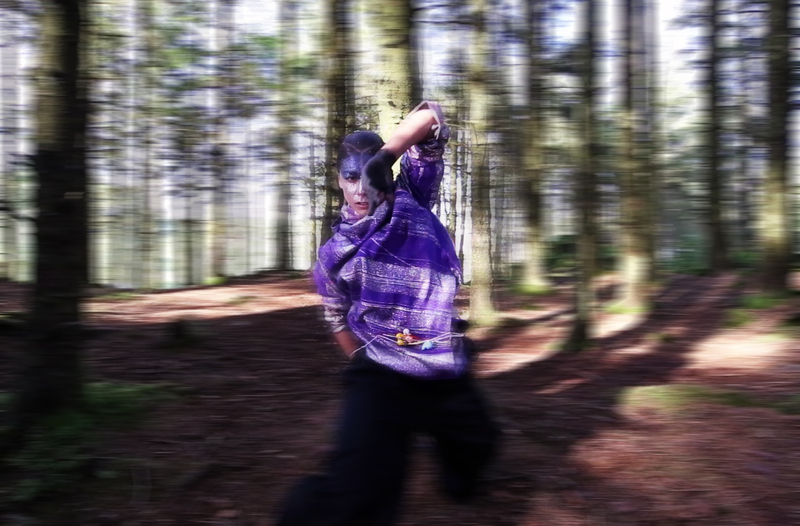 The woods, wild and mysteri­ous from afar, appear as a stage on which every element is considered. Genetically engineered plants, artifi­cially sustained, are hanging from the trees, embedded in the ecology yet detached from it. Their scaffolding systems of gleaming steel and neon light sway in the wind, waiting. Grey wolves approach the struc­tures during the night to scratch their body on the steel branches. 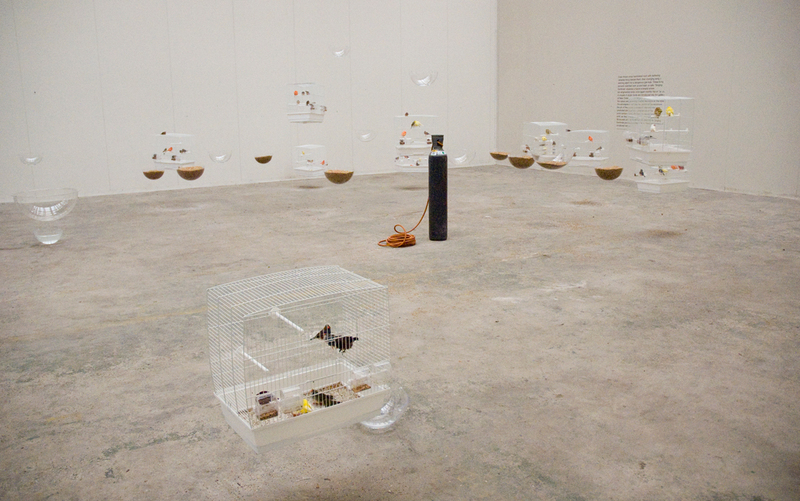 In an intri­cate arrangement of devised symbio­sis, the contraption takes on the role of host organism. The wolf’s move­ments generate electricity for the system, while the blueberries are engineered to contain rabies vaccine in its fruit to protect the animal from self-destruction. 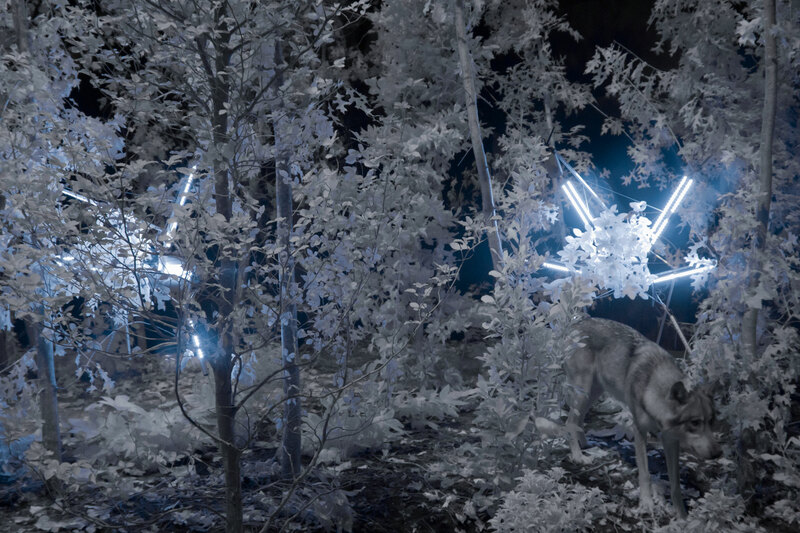 Cameras transmit footage of the wolf’s presence around the globe, adorned in invisible garlands of elec­tric display, to be enjoyed by those whose passion for the spectacle of wilderness sustains its survival. 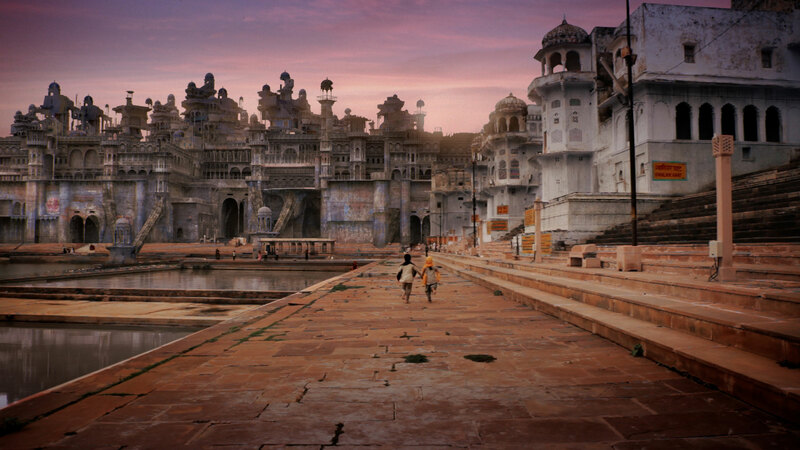 Future Perfect is a fictional, future city. A think tank of scientists, technologists, designers, artists and science fiction authors have collectively developed this imaginary place, the landscapes that surround it and the stories it contains. The following series of posts presents the Future Perfect exhibition- a stage set for a collection of fictions, movie set models, emerging infrastructures and design experiments that can be inhabited as immersive districts of the future city. This post presents the Future Perfect Supercomputer, an interactive installation developed by artists Marshmallow Laser Feast. Laid across the physical city is a virtual doppelganger, a ghost landscape of hyperlinks, geo tags, digital maps and satellite scans. The air is thick, charged with bits, bytes, electrons and energy fields. A network of tracking cameras follows us as we wander across this data city, our gestures and movements, translated and then beamed as dynamic forms of light that animate around us. 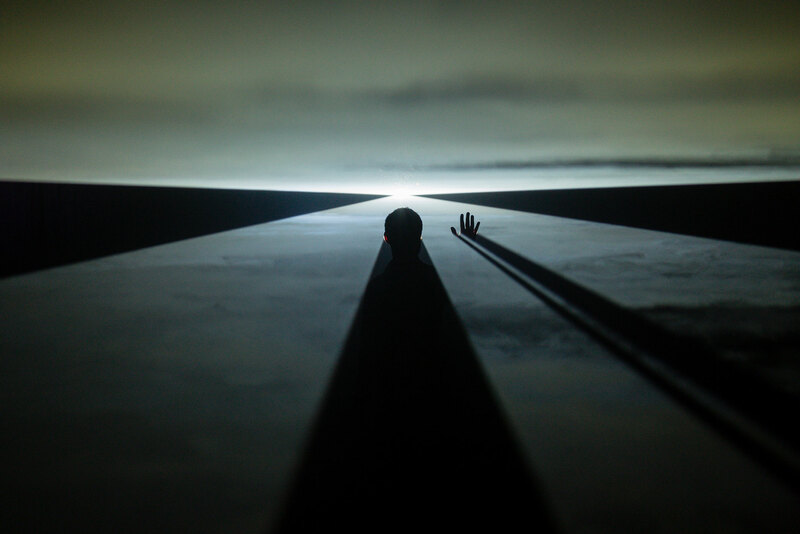 Like flamboyant conductors, the audience interacts with an array of high powered projectors that give life to a luminous terrain of mountains, clouds and particles. 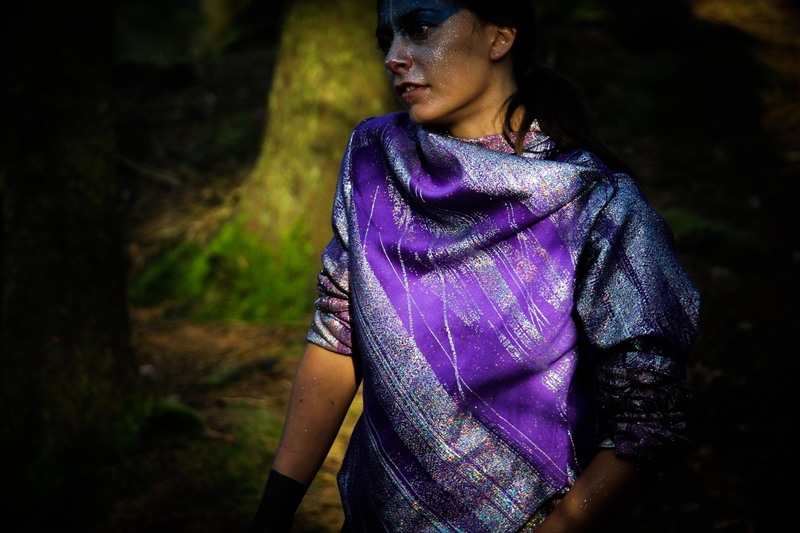 By employing directional audio technology, a synthetic soundscape feels almost real, conjuring a visceral experience of a world currently hidden in screens, circuits and hardware. Follow paths of sound, listen for the edge of a surface, see it shimmer, and drift right through, like a rock falling in the sea. 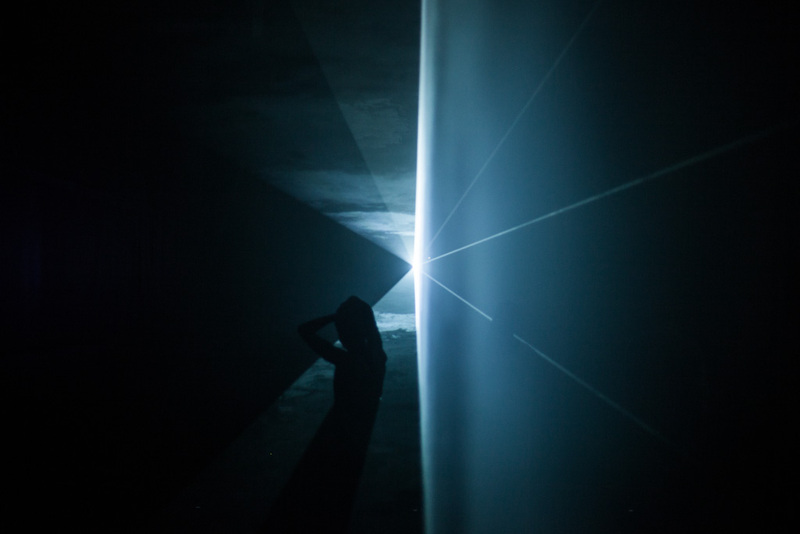 It is a new model for interfacing with technology and the invisible world that completely envelopes us- an inhabitable visualisation of the digital that glows in the haze and then flickers into darkness. The project was an evolution of some earlier studies developed by Marshmallow Laser Feast seen in motion here. Darryl Chen’s New [Socialist] Village is a research project that asks whether China could teach the UK how to plan. 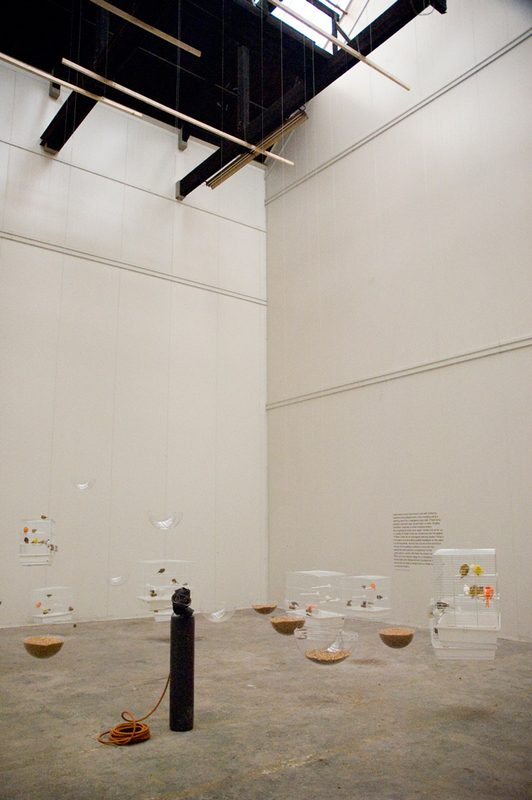 It was exhibited at the 2012 Venice Biennale British Pavilion as part of the Venice Takeaway: Ideas to Change British Architecture research project; and at RIBA London from 26 February until 27 April. 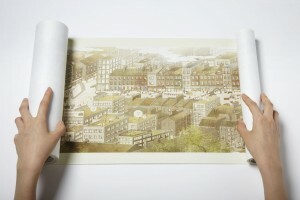 Quoting Mao Zedong, imagining Ai Weiwei as an urban strategist, and citing Communist China as a model of flexible governance, the New [Socialist] Village proposes handing revolutionary power back to local people while co-opting the entrepreneurial skills of Richard Branson to create a model entrepreneurial village for the UK. Under Tomorrows Sky. A new project for the Future City. 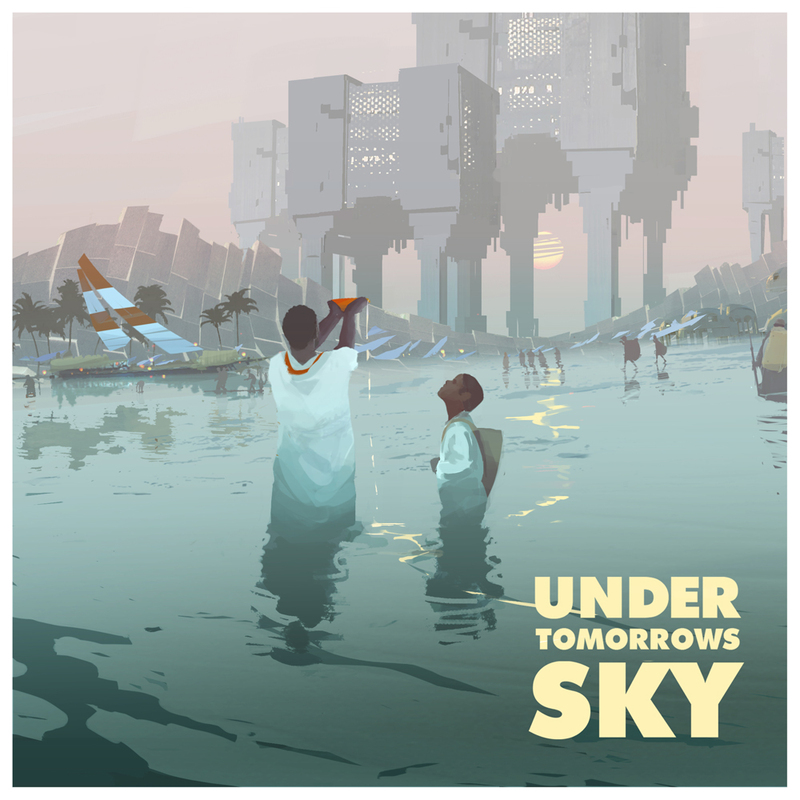 Under Tomorrows Sky is a fictional, future city. For MU Foundation in Eindhoven Speculative architect Liam Young of the London based Tomorrows Thoughts Today has assembled a think tank of scientists, technologists, futurists, illustrators and science fiction authors to collectively develop this imaginary place, the landscapes that surround it and the stories it contains. Working with special effects artists from such films as Alien, Sunshine and Blade Runner, the architects of Tomorrows Thoughts Today have built a room sized movie miniature model of the city. 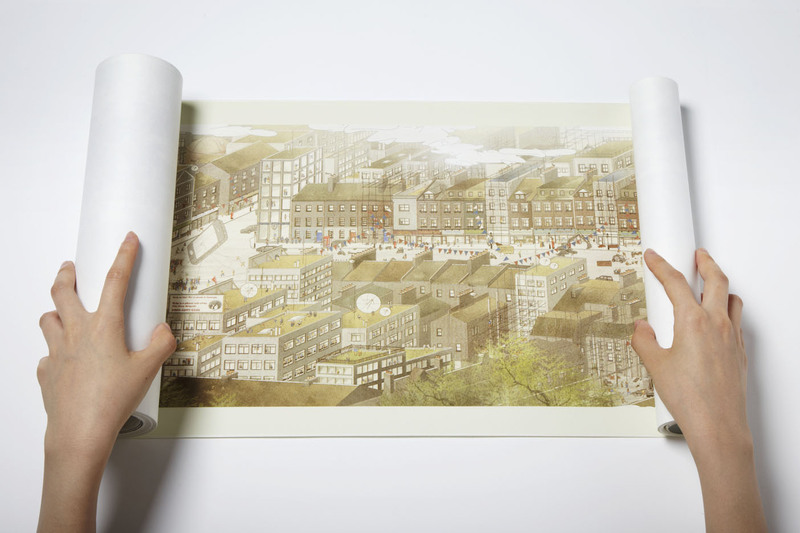 Across the course of the exhibition invited guests will work with the city as a stage set to develop a collection of narratives, films and illustrations. Wander through this near future world and explore the possibilities and consequences of today’s emerging biological and technological research. The team includes Bruce Sterling, Warren Ellis, Rachel Armstrong, Daniel Dociu, Paul Duffield, Factory Fifteen, ARC magazine, Centre For Science and Imagination and many more. Follow the project website to see all the concept art imagery, the think tank discussions and photos of the exhibition. 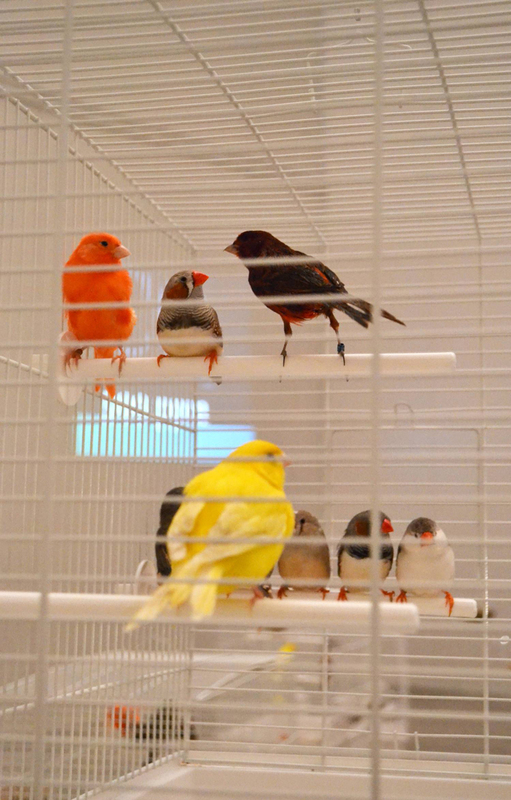 Coal miners once hammered rock with twittering canaries living beside them, their changing song a warning alarm for a dangerous gas leak. These living sensors watched over us and kept us safe. 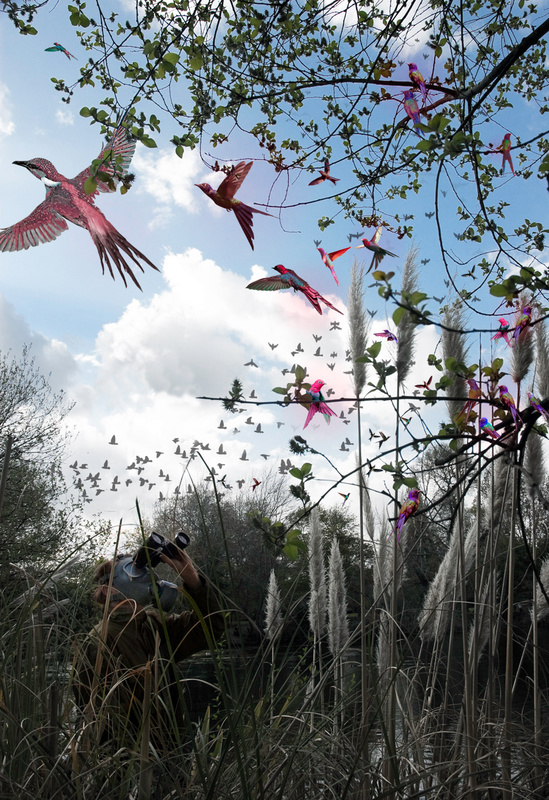 ‘Singing Sentinels’ by London-based architect Liam Young of Tomorrows Thoughts Today explores a future scenario where bio-engineered birds once again monitor the air for us. 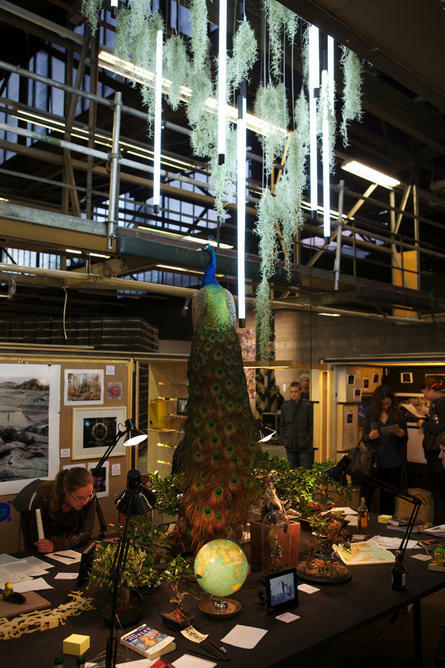 Eighty birds have been released into the New Order exhibition at the Mediamatic Gallery in Amsterdam as an ecological warning system, living in the space and providing audible feedback on the state of the atmosphere. Across the course of the exhibition Liam performed the climate change acceleration piece ‘Silent Spring’ seen in the film above. As a ‘pollution DJ’, he flooded the gallery with CO2, altereing the air mixture to replicated the predicted atmospheric changes of the next 100 years. 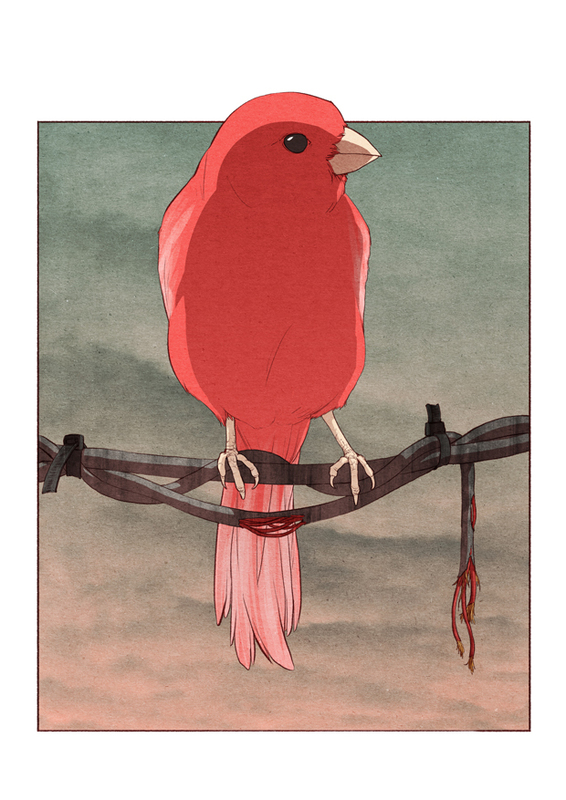 We hear the canary song subtly shift, their rythmn change and eventually silence, as the birds sing a toxic sky- an elegy for a changing planet. To accompany the exhibition Liam Young, Geoff Manuagh and Tim Maly have written a near future birdwatchers guide “A Field Guide to Singing Sentinels: A Birdwatchers Companion” with illustrations from comic illustrator Paul Duffield. You can see an excerpt and purchase your copy of the limited edition book online here. See below for exhibition photos. 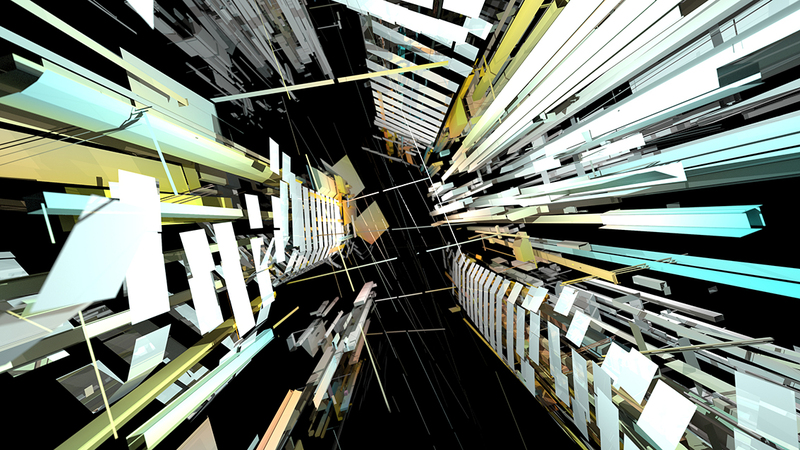 In the skies above the city a drone flock drifts into formation broadcasting their local file sharing network. Part nomadic infrastructure and part robotic swarm they form a pirate internet, an aerial napster, darting between the buildings…. 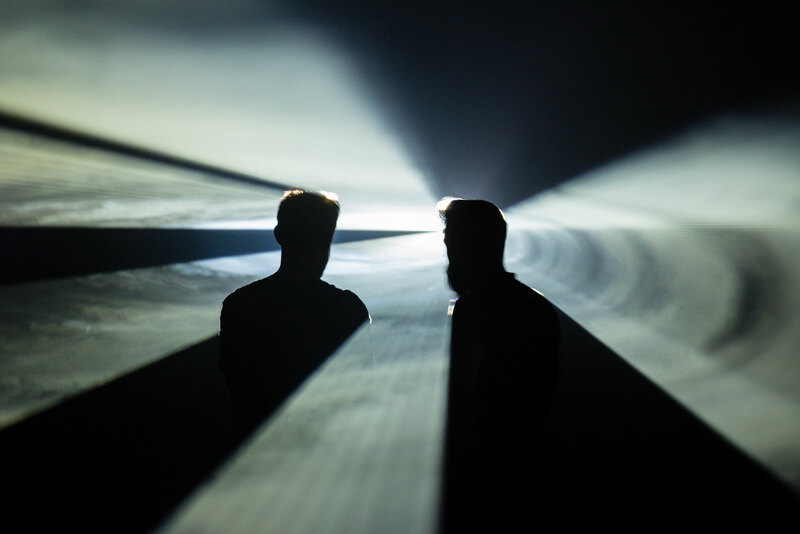 Tomorrows Thoughts Today will be premiering their new interactive installation Electronic Countermeasures live at the GLOW Festival Eindhoven NL every night 5th – 11th November. The performance schedule is 1800, 1830, 1900, 1930, 2000, 2030, 2100, 2130, 2200, 2230, 2300, 2330. See the map for where you can find us. 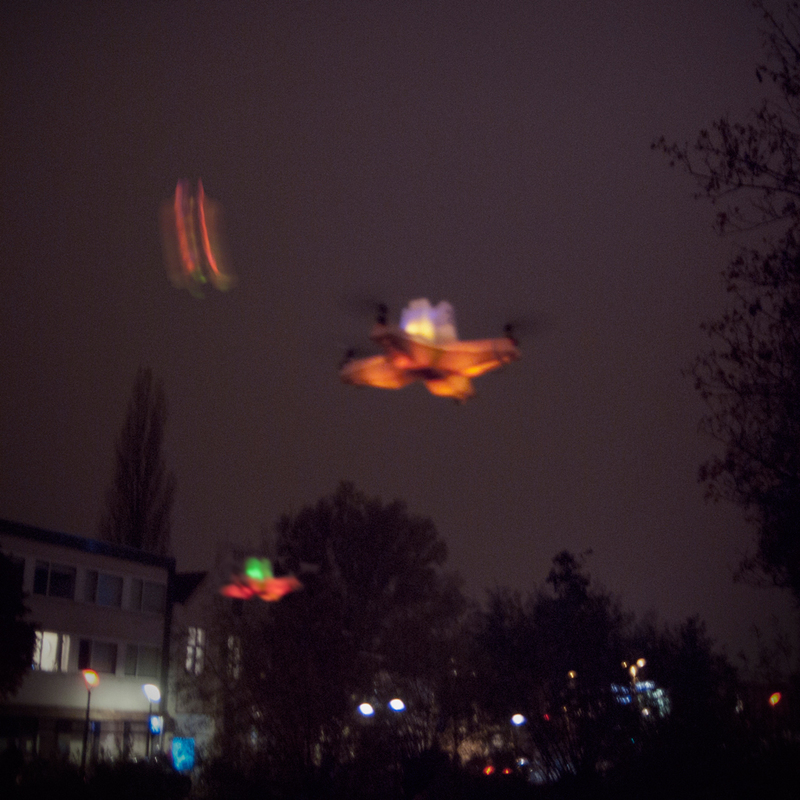 The project is an aerial drone choreography developed in collaboration with Superflux and Eleanor Saitta and performed by drone pilots Oliviu Lugojan-Ghenciu and Eleanor Saitta. Today we are much closer to our virtual community than we are to our real neighbours. This death of distance has created new forms of city based around ephemeral digital connections rather than physical geography. In this context the Electronic Countermeasures explores the design and manufacture of a flock of interactive autonomous drones that form their own place specific, local, wfi community and pirate file sharing network. 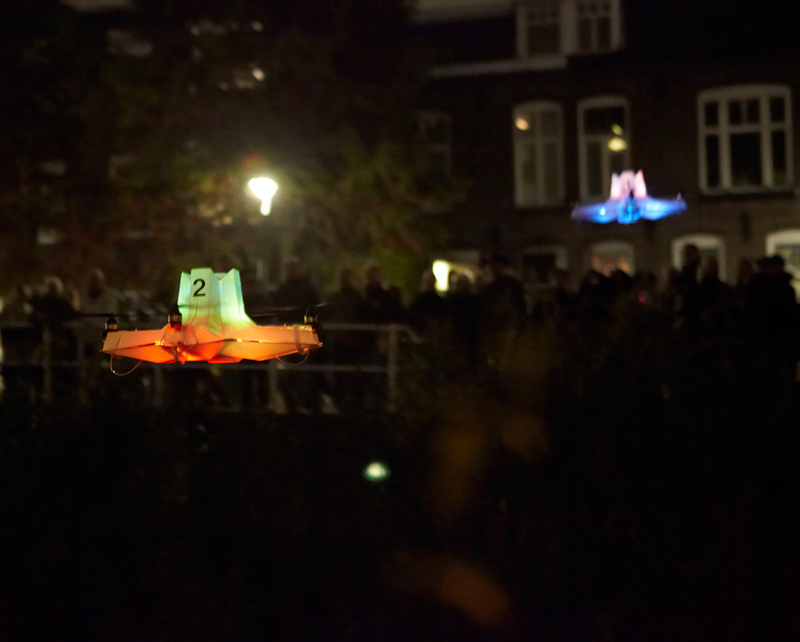 Drifting slowly above the water of Eindhoven’s parks the fleet of modified quadrocopters perform a balletic aerial choreography as their soft glow reflects in the canal below. As we signal the drones they break formation and are called over. Their bodies illuminate, they flicker and glow to indicate their activity. The swarm becomes a pirate broadcast network, a mobile infrastructure that passers-by can interact with. 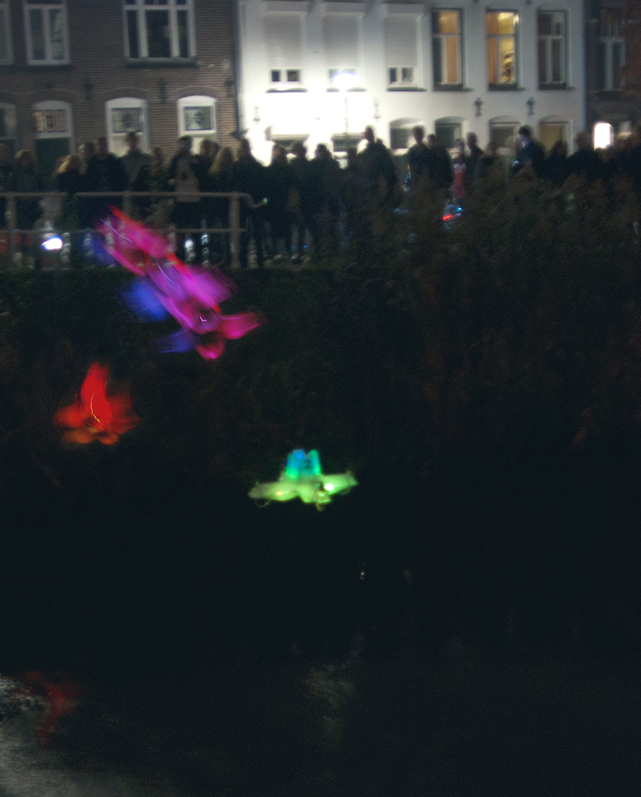 Impromptu augmented communities form around the glowing flock. As more people interact with the drones the more excited the flock becomes. They swoop dramatically across the surface of the water and they hover above the heads of all those with their mobile screens still activated. It is almost as if these glowing blimps are alive as they become mobile infrastructures with endearing behaviours. 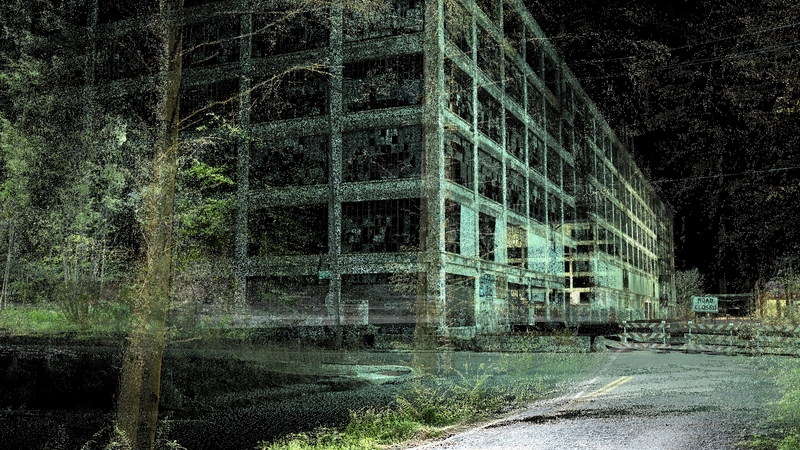 They are part city infrastructure and part technological creatures living amongst the trees. Performed by Oliviu Lugojan-Ghenciu and Eleanor Saitta. In addition to Tomorrow’s Thoughts Today, participating artists are Brazilian social and cultural collective Project Morrinho, Belgium-German art collective Speedism and Moroccan artist Mounir Fatmi. The collaboration of these four global creative practices in the arena of MU unite around the mythic Tower of Babel theme, presenting us with new angles from which to view this legendary subject, and arguing for its social, political, and cultural relevance in today’s world. 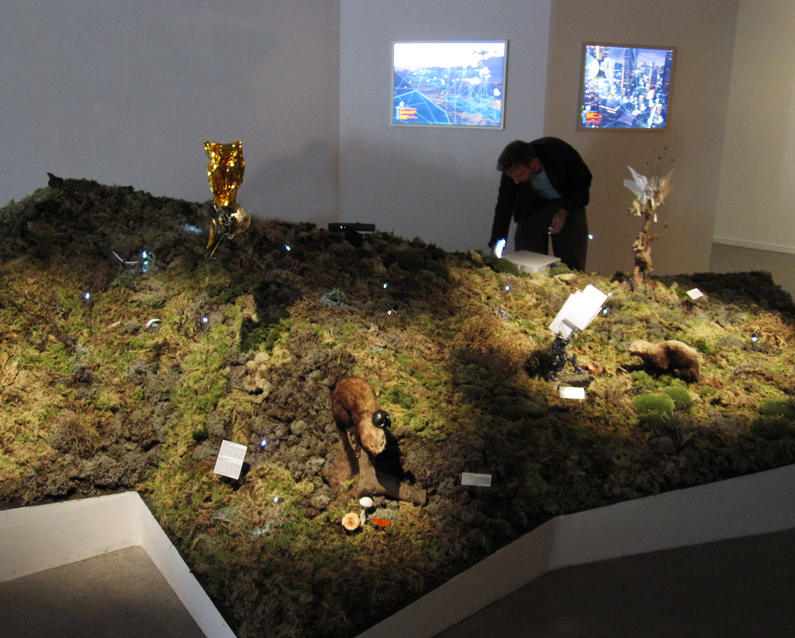 Tomorrows Thoughts today (in collaboration with Denis Vlieghe and Oliviu Lugojan-Ghenciu) have installed an expansive living landscape of moss and robotics. Set within the vegation is a array and strange and curious creatures of the near future. Born of the city’s electronic surplus yet now essential to the city’s function, these species of beings have emerged who warm, warn, entertain, annoy, and play. They have arrived unannounced, emerged from the remains of rampant and uncontrolled modernisation, and have been subsumed into the normal workings of the city. In fact, the city itself has become a singular sentient being constructed of these malformed and (d)evolved freaks — the city’s new infrastructure. Observation notes: A landscape of artificial trees flicker with a distant wind. 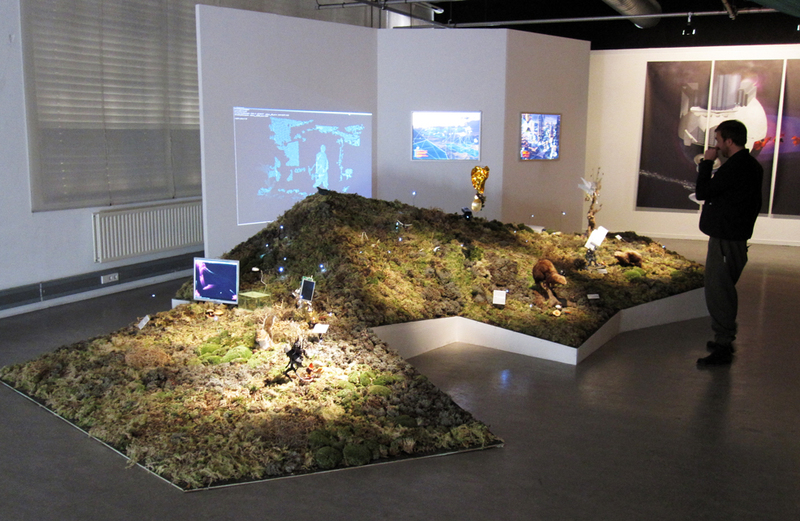 The augmented forest is wirelessly connected to a wind sensor in the Aokigahara forest at the foot of Mt Fuji. 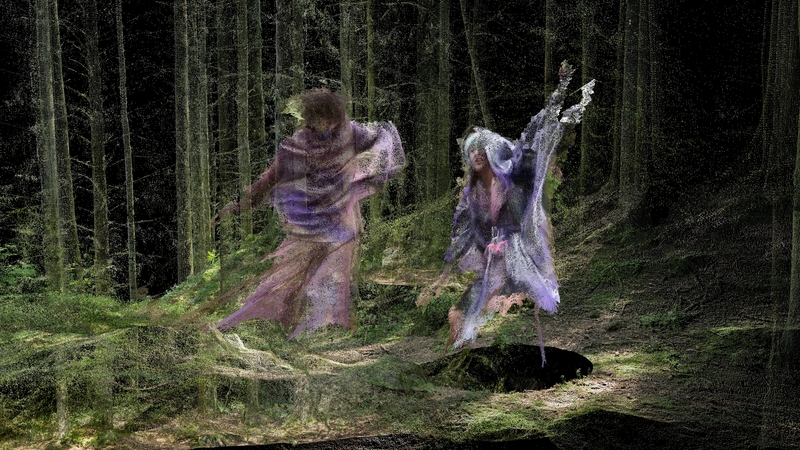 Thought to be haunted the remote presence of the winds rustling through the trees in Japan now illuminates a virtual ghost wilderness. Two simultaneous landscapes connected across the globe. 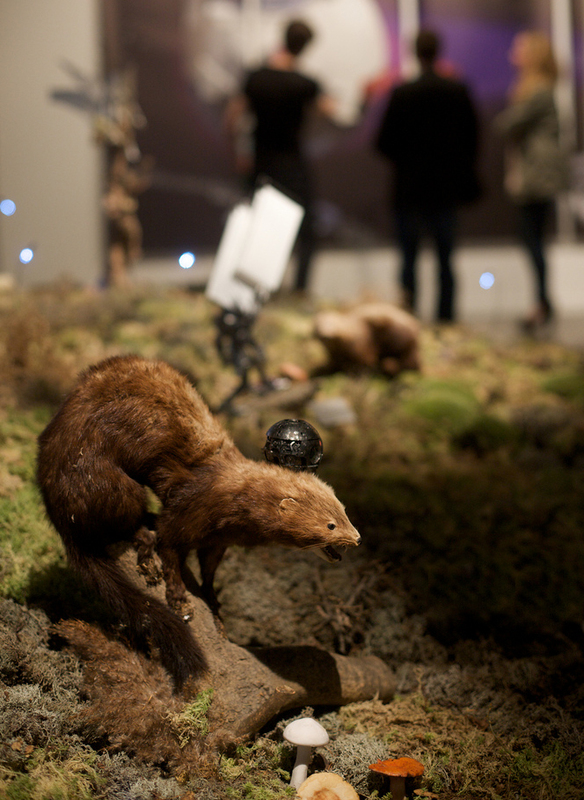 Observation notes: Existing animals are hacked to create a roving sensor network across the landscape. 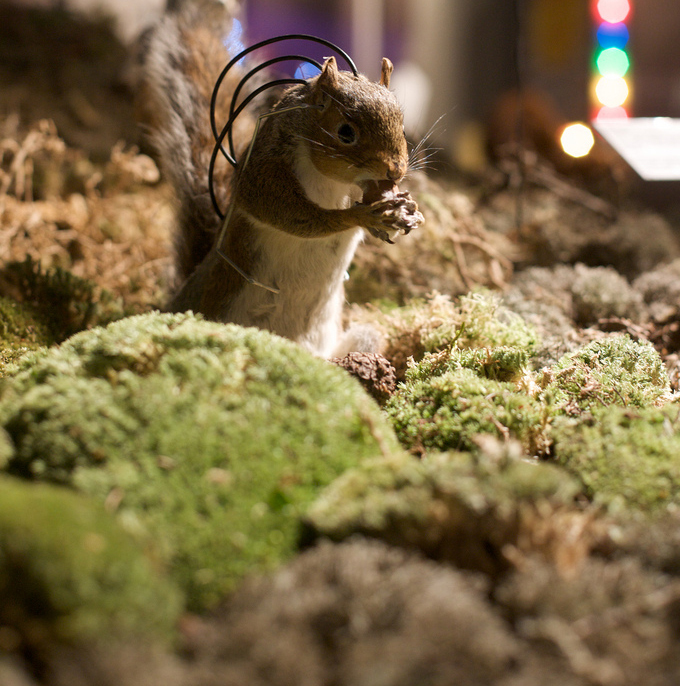 Like the old canaries in the coal mine birds sense and detect levels of toxicity in the air, grey squirrels track their own pest populations to extermination, moths and butterflies become a micro spy infrastructure and others monitor and scan for subtle ecological shifts. Observation notes: Sensors track a lonely goldfish swimming in a tank. It becomes the live input for an emerging digital simulation. The fish’s movements are translated into an endlessly evolving online avatar that continues long after it is flushed away. 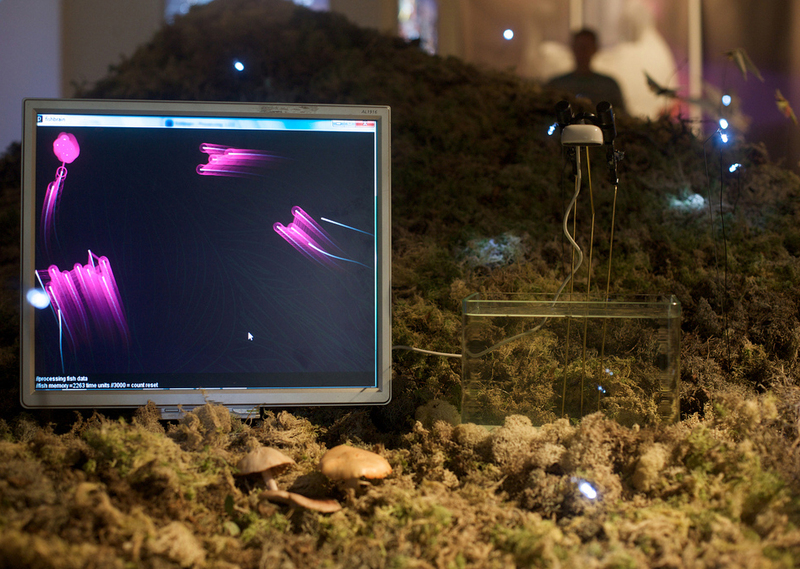 Across time a virtual ecosystem takes shape on the web. Soon the internet becomes more of a wilderness than the disappearing landscapes of the physical world, a strange zoo of virtual ghosts. Observation notes: Feeding off ambient electro magnetic fields of the cities neon lights and communications networks these floating antenna harvest the airborne energy to power a broadcast of white noise. 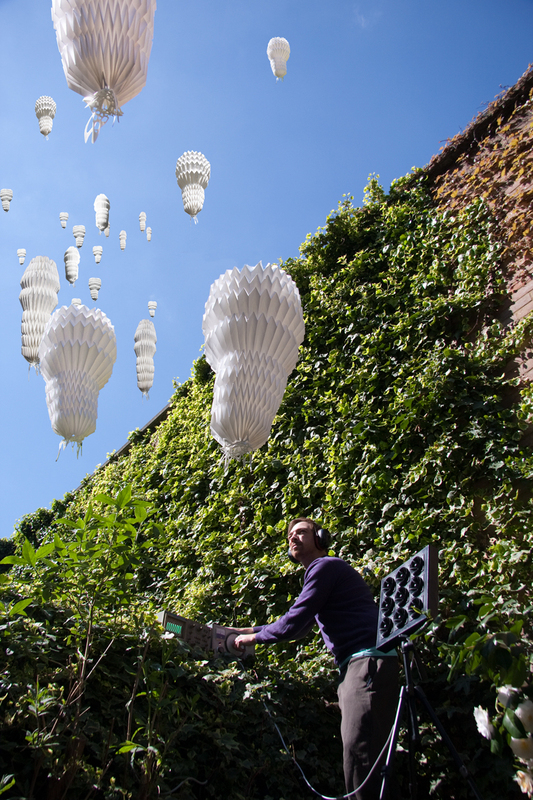 Clouds of these blimps cast an electronic shadow across parts of the city. Initially an experiment in energy harvesting this infrastructure is now just gets up to general mischief but unexpectedly it also has creates some of the only disconnected analogue spaces in the city, where one can steal a brief moment of digital silence. Observation notes: Relentless and obsessive the tracking eye of the monitor drones scan ambient conditions and is sensitive to minute fluctuations in vast arrays of environmental data. 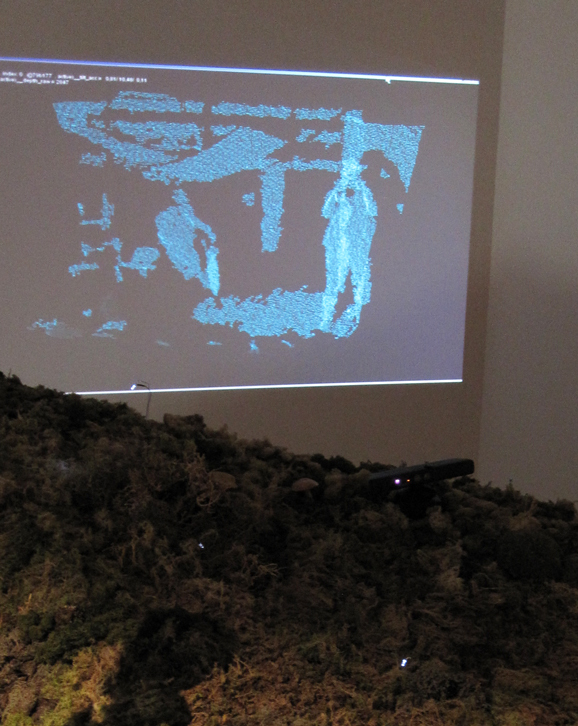 Flocks laser scan the landscape recording animal numbers and vegetation patterns as point clouds of digital data. Wilderness sites become large curated landscapes constantly managed and engineered to create a perfect simulation of nature in balance. This is one fragment from the work. See Volume no. 24 Counter Cultures for more from the Strange Natures of Nanotechnology. A field guide to toxicity machines. Highlight: Sensitive to high levels of CO2 in the air. Description: When in the presence of high levels of carbon dioxide, their plumage phase shifts to an extraordinary emerald color. Coal-gulls can be found in gathering around the remaining coal-burning power stations and carbon sequestration centers. Take a fire extinguisher with you to draw them out of the trees. Note that caution is necessary when calling and tracking these birds, as evidenced by the ongoing litigation against a BBC documentary team for frivolous chemical spraying. Highlight: Engineered to monitor atmospheric levels of nitrous oxide. Description: Typically brown and forgettable at ground level, in the presence of the greenhouse gas nitrous oxide the Roseshift Starling displays a fanned tail of extraordinary incandescent plumage that reflects in the sunlight. These rare species are best spotted in gas cloud flocks at high altitudes or over recently fertilized farmland. 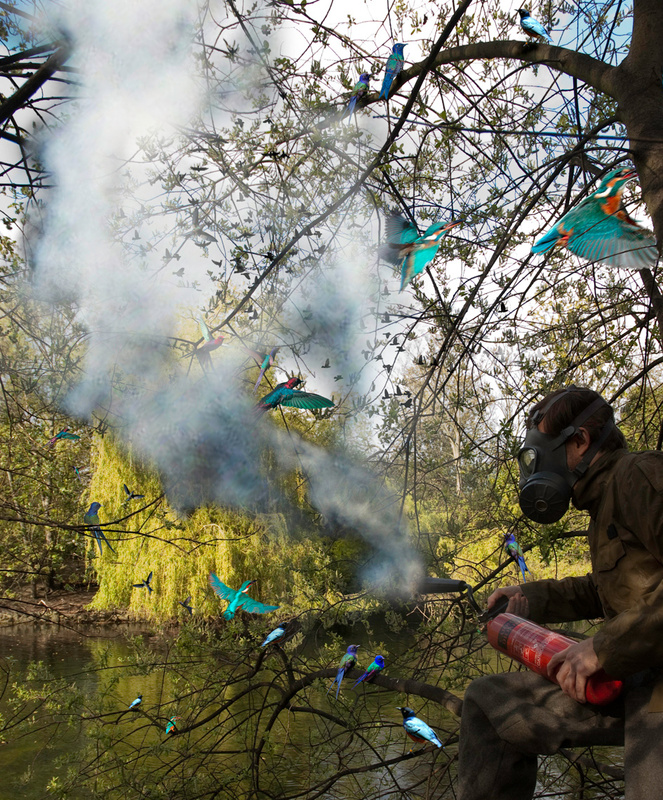 If you do encounter one on the ground, however, emptying a nitrous canister nearby will initiate its vivid display. These can be acquired from custom car garages or contact us for our private list of birding dentists. NB. The guide does not encourage nitrous use for anything other than bird watching. We do not support the ‘laughing birders’ organization. Description: Originally developed to signal the location of explosives labs, Bomb Sparrows flock in elaborate formations marking the atmospheric presence of chemically dangerous concoctions. Typically very difficult to track down, their formations are dispersed very quickly by British intelligence; making clear sightings quite rare. Your best chances are in the outer suburbs or anonymous tower blocks. If you are lucky enough to see an actual detonation, Bomb Sparrow flocks are extraordinary. But be careful: mixing your own chemical lures may result in prosecution under the Prevention of Terrorism Act. Highlight: Sings in the presence of concentrations of carbon monoxide. Description: This species typically makes its nest along busy highways and main streets. Listen out for the high-pitched song of the Trumpeter Finch when airborne particulate levels reach toxicity thresholds. 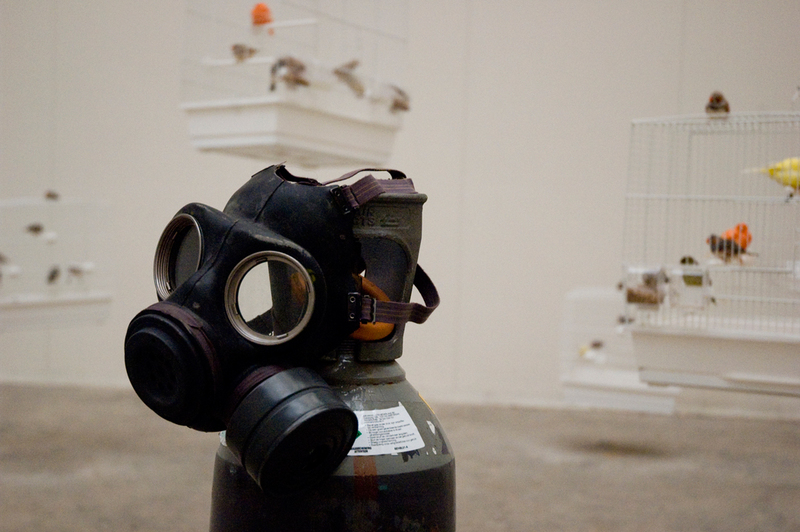 Go in an SUV convoy for the best chance—and pack a gas mask to hear their song up close. This is an exerpt of the travelogue from Acres Green. See slow thoughts for the Beamer Bees, Mobile Mountains and Prosthetic Trees and more from this strange little community. By Anab Jain + Jon Ardern of Superflux, Liam Young + Darryl Chen of Tomorrows Thoughts Today and Chris Hand and the ‘Power of 8’ team. At first the residents didn’t know what to call them. The once strange creatures had no name. Maybe there was a manufacturing code, or an RFID tag attached surreptitiously to their underbelly, but nothing official or as obvious as a logo like on a newly unveiled car. No motor show. No fanfare. They just arrived.